Ultrasound has become a widely used preclinical imaging modality that can be used to visualize a variety of internal structures within small animal models with high resolution (down to 30µm). This provides researchers with primary structural information in real-time allowing for the non-invasive quantification of organ/tumor parameters in both two- and three-dimensions, as well as measurements related to cardiac function and blood flow. When it comes to its capabilities in cancer-based studies, ultrasound is ideally suited to image most preclinical models including orthotopic, transgenic, and xenograft tumors. The high-resolution of these systems allows researchers to easily identify and visualize primary tumors as well as metastases, distinguishing them from the normal surrounding structures; tumor size may also be quantified in either in two- or three-dimensional images. Further, the availability of non-targeted contrast agents allows for the visualization and quantification of tumor perfusion; while targeted contrast agents allow for the detection of specific cell markers such as those important to angiogenesis. Also note that, due to the non-invasive nature of ultrasound imaging, longitudinal studies may be conducted on the same animal to monitor tumor progression, or to study therapeutic efficacy over time. B-mode imaging can be used to detect, count, and measure tumors across a wide range of tissues in small animal models. Regardless if one is using orthotopic, xenograft, and transgenic tumor models, each can be imaged using ultrasound. Tumors are visible in any number of abdominal organs, muscles, or those implanted subcutaneously. 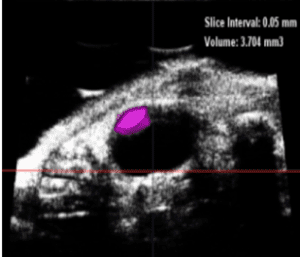 Both 2D and 3D B-mode images can be used to locate and measure tumors. Further, while commonly used for liver fibrosis and musculoskeletal changes, researchers interested in studying the mechanical or elastic changes related to cancer lesions located close to the surface of the animal may have interest in the shear wave elastography functionality of ultrasound. Shear wave elastography is a technique used to assess changes in tissue stiffness, providing fully quantitative outputs. Power Doppler may be used to assess vascularity in larger vessels of tumors, while contrast imaging, in the form of microbubbles, may be used to assess perfusion in tumors and the surrounding structures. The gas-filled microbubbles that are administered intravenously to the systemic circulation have a high degree of echogenicity and return a harmonic sound wave as well, allowing for the sensitive detection of flow within the microvasculature. Further, targeted microbubbles may be used to detect specific molecular targets making this a highly dynamic technique for cancer researchers. Image guided needle injection may be of interest to some researchers wanting to inject tumor cells into very specific anatomical targets with higher accuracy, for example direct injection of a therapeutic agent into a tumor or large vessel (i.e. the portal vein) feeding an effected organ. Last, sonoporation may be of interest to those studying drug and/or gene delivery in cancer research. Sonoporation is the controlled cavitation or bursting of microbubbles which may contain the drug of choice, at a specific location. Sonoporation causes the drug to be released at a specific target but can also be used to increase the permeability of the cell membrane within a specific location. Enhanced drug delivery through sonoporation aids in treatment of tumors with dense stroma such as pancreatic tumors, and with less systemic toxicity than traditional chemo. Ultrasound induced sonoporation is also a superb option for delivery of genetic material when compared to the alternative methods as it is easily done in vivo and can greatly increase the specificity of treatments. The S-sharp Prospect T1 provides small animal researchers the ability to visualize and quantify anatomical targets, hemodynamics and therapeutic interventions with a resolution down to 30µm. This is a cost-effective (3 to 4 times less expensive than comparable systems) system that allows individual preclinical labs to perform ultrasound imaging on their own schedule without the need to try to find availability or to pay per-usage fees charged by some imaging cores. To learn more about this system visit the Prospect T1 page.